Industry (population 540) is located in upper-western Illinois in the southwestern portion of McDonough County. The town is situated about 10 miles to the southest of Macomb. Illinois Route 67 is the main roadway to and from town. The Grindstone Creek flows by the northwest side of town and there is a small lake just west of town as well. The year 1846 saw the first settlers come to the area now known as Industry. The town was platted in 1855 and saw its first government formed in 1867. 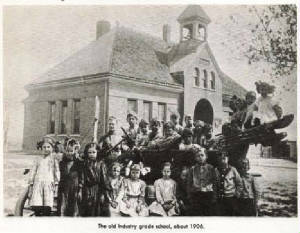 A school was established in Industry in 1866. More on the history of Industry can be found at http://www.macomb.com/~ilmcdono/townships/IndustryTown1885.html . "I received this photo from Ted and Ellen Tingley. This is a photo of my Grandad, Claude Tingley, sitting in the back seat of car when he graduated from Industry High School, Industry, IL. The date is approximately 1910. He was born May 3, 1892 and died May 30, 1980. Grandad was the only member of his graduating class, the first graduate of this high school. In the front seat are the two members of the junior class at Industry High School, we think. Don't know who the gentleman standing is. The Industry High School was on the north edge of town. Our Mother, Carol, also graduated from this school in 1938." Can you identify the persons in the front seat? If so let us know. The history of the town's high school is in need of research. It is quite likely that high school curriculum was in place by the late 1800's. 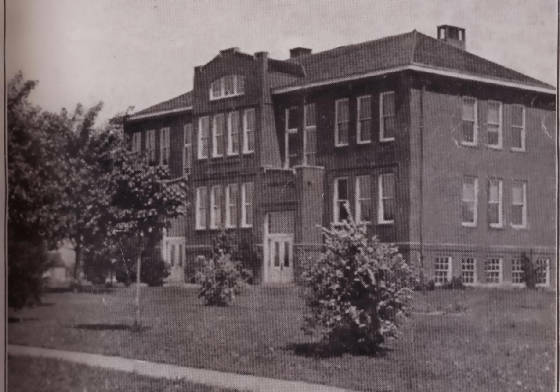 Industry High School served the community for over 100 years. Unfortunately, dwindling enrollment was among other reasons that a consolidation effort was started with the neighboring town of Rushville. This effort became a reality after the 2004-05 school year with the creation of the Rushville-Industry School District. The high school for the new district is located in Rushville. We believe the former Industry High School building is now used as a grade school for the Rushville-Industry school system. "I am seeking a photo of a girl named Nedra Shores who attended Industry Grade School between 1919 and 1926. Probably never went farther than 8th grade. Her parents were Ed and Lurlan (Kellum) Shores. She was born in 1913 and died in 1995. This was the mother of my cousin and she does not have a picture of her mother, so I told her I would see if I could locate a grade school photo of her. If you have any sources that could help me to locate this I would certainly appreciate it. Thank you for any assistance that you can give to me." Contact us if you can. 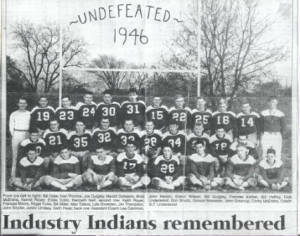 Industry HS team nickname: up until 1956 - the "Indians"
after 1956 - the "Eagles"
School Fight Song: "We're Loyal To You, Industry!" We're loyal to you, Industry! Our love is for you, Industry! For in you we have faith, Industry! For the red and gray ("green and gold" after 1956), Industy. To labor long and true, INDUSTRY! 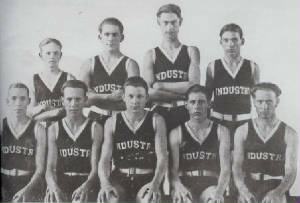 The Industry High School Eagles were known for their competitive nature in spite of being often the smaller school on the court or field. Boys' basketball and girls' softball both had some great seasons. The boys competed in baseball, football, and track, while the girls competed in volleyball and track as well. School fight song is being sought. Three District titles and a Regional title hi-lighted the Eagle hardwood court success. One of the Districts (1924-25) was significant in that it came when the District was actually comparable to a Regional. The coach's names and better team records of the Industry Eagles boys basketball program as found on the IHSA website (www.ihsa.org) are listed below. Two Regional titles were the best seasons the Lady Eagles enjoyed. The coaches' names and better team records of the diamond ladies are listed below. 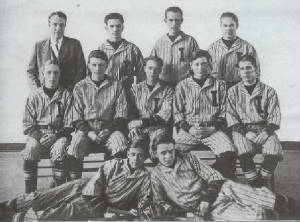 The boys' baseball team at Industry High School did not win any IHSA hardware. However, they competed well and gave the hometown fans a great many good memories. Games were scheduled against Canton, Prairie City, Fountain Green, Farmington, and Springfield. Flack, Pennington, Russell, Price, Gunning, Leininger, R. Graham, L. Graham, Janes, Duncan, Young, Justus, Frazier. One male athlete brought home a total of three medals from the IHSA State Track Meet. Steve Onion won all three of his medals in the "weighted" field events. The Industry Lady Eagles flew high over the net in this sport. Several incredible seasons marked the mid-1990's under the direction of Coach Cinda Martin Brodie. This was accomplished in a hotbed area for girls volleyball which included the seemingly always state-bound Colchester teams. The Industry girls faired well in posting six 20-win seasons and one 30-win season! 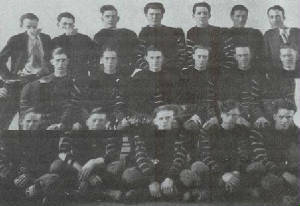 Yes, this small town school had their own football team at one time too. 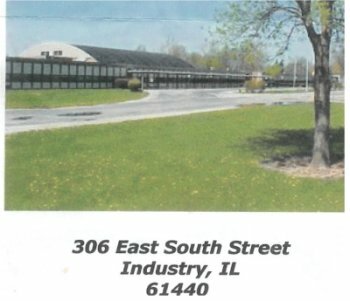 The better records and accomplishments of the grid iron heroes of Industry High are listed below as researched by Tom Sikorski. Pennington, Wilson, Flack, Justus, Price, Aten, Russell, Leininger, Runkle, Griffith, Stoneking, Edgar, Springer, McKamy. As the above photo states, the Industry High School football team of the fall of 1946 was a special one. The team finished the season undefeated at 8 - 0 scoring 332 points while holding their opponents to a total of 33 points. 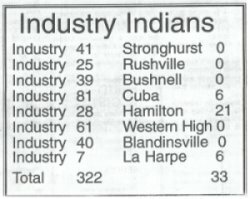 As you can see on the schedule to the right, Industry's defense posted 5 shutouts and were considered by many as the best small town high school football team in the state. The team featured the leading scorer in the state, Max Toland, who finished the season with 153 points. The school's enrollment in the 1946-47 school year was 101, with 57 of those enrolled being boys, 28 of whom played football. 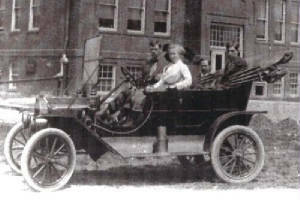 At that time Industry often benefitted by getting students from nearby Littleton, who would transfer to Industry for their senior year as Littleton High was but a three-year high school at the time. 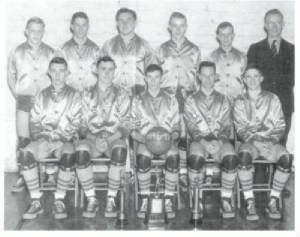 Coach Underwood attempted to schedule a game with nearby Beardstown and Farmington, also undefeated teams in the area that year, however his bid to do so was never realized.